Swim with dolphins in Hawaii. Dolphin tour company in Hawaii promoting dolphin snorkeling tours as well as whale watching, turtle snorkeling and more. Jeremy was excellent to work with. Great email communication and great service. We are very pleased with our new website for our Japanese speaking clients. The site turned out very nice and is easy to navigate. The entire theme and look of the site really portrays our business ideals. We are looking forward to working with you again on future projects. 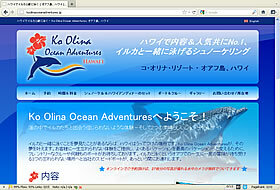 Thanks Again from Hawaii, Ko Olina Ocean Adventures.